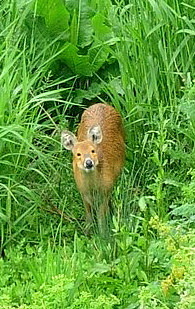 The Chinese water deer is native to China. They have tusks instead of antlers and this indicates that it is a very primitive form of deer. In China they are indigenous to the lower reaches of the Yangtze River. They were first introduced into the UK in 1873 and kept at London Zoo. In 1896 they were transferred to Woburn Abbey, Bedfordshire and in 1929 32 deer from Woburn were transferred to Whipsnade Zoo. Most of those now in the wild in the UK are thought to be descendents of some that escaped. These introductions into deer parks, and subsequent escapes and releases, have facilitated their spread, although the wet habitats in the fens of Cambridgeshire and the Norfolk Broads seem to provide them with the best habitat in which to thrive. A small species intermediate between muntjac and roe deer. Their ears large and rounded and their coat a russet-brown in summer pale to grey-brown in the winter. They do not have antlers but large protruding tusks in bucks (males), which are generally only visible in adults. The tusks are used as weapons during the rut and in defence against predators. Life Span: Up to 6 years, although up to 40% of fawns die within the first four weeks of life. Statistics: 11-18kg, 50-55cm at shoulder. Little variation between sexes. Habitat: Reed beds, river shores, woodlands and fields. A good diversity of plants in the under-storey (herbaceous and shrub vegetation below the canopy) is important. Food: Selective feeders that take small morsels from nutritious plants, especially herbs but may take woody browse, grasses and sedges if food is limiting. Breeding: Does give birth during May to July after a 6-7 month gestation. Up to 6 fawns may be born, but 1 to 3 is more usual. The does give birth to spotted young in the open and then quickly takes them to concealing vegetation will they will remain for up to a month. Distribution: Currently restricted to Bedfordshire, Cambridgeshire, Norfolk and Suffolk with a few scattered sightings elsewhere. Behaviour: Solitary except when mating. Bucks are highly territorial and particularly aggressive and do not tolerate the presence of other bucks. Confrontations between males begin with the animals walking slowly and stiffly towards each other, before turning to walk in parallel assessing one another. At this point, one male may succeed in chasing off his rival, making clicking noises (whickering) during the pursuit. However, if the conflict is not resolved at the early stage, the bucks will fight. Each trying to wound the other on the head, shoulders, or back, by stabbing or tearing with their upper canines (tusks). The fight is ended by the loser, who either lays his head and neck flat on the ground, or turns tail and is chased out of the territory. Numerous long scars and torn ears seen on males indicate that fighting is frequent. The fights are seldom fatal but may leave the loser considerably debilitated. Both sexes give a short bark when alarmed or as a warning and scream when chased. Whistling and squeaking is emitted by the buck as he follows a doe during courtship. The doe also emits a soft pheep to call to their fawns. They are active day and night, but peak time for activity is around dusk. The rut is between November and December and during this time the bucks and does form pairs and defend territories and stay together until April. You may also find tufts of fur on the ground amongst the vegetation around this time of year. Conservation Status: IUCN Red Data Book listed as "lower risk, near threatened" in China. The British population is thought to account for 10% of the world's population.